PALM DESERT – Twelve pieces of Coachella Valley Water District equipment were stolen over the weekend, pushing the number of metal thefts for the first six months of the year higher than the 2013 total. 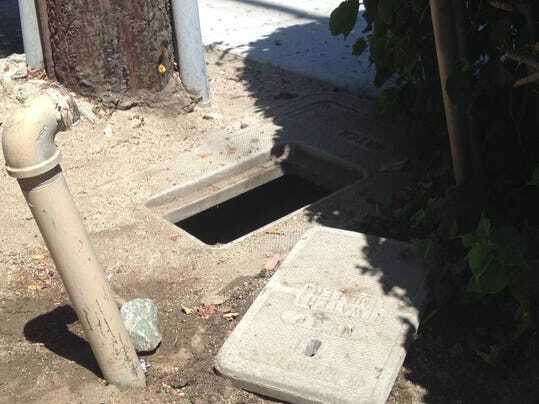 Nine backflow devices and three fire hydrants were reported stolen from various locations Monday morning, CVWD spokeswoman Heather Engel said. The thefts come less than two weeks after 17 other backflow devices were taken from the parking lots off of Village Court in Palm Desert. Engel said 416 devices were stolen this year — surpassing the 190 backflow device thefts in 2013. Two backflow devices were taken from Alessandro Drive in a residential area north of Highway 111 in Palm Desert. The thefts cut off the water supply to Pittsburgh Paints, 74-240 Highway 111, and workers couldn’t wash their hands or use the restroom Monday morning. They also couldn’t wash equipment or serve customers coffee. “It’s frustrating,” said David Vandersall, a sales representative. It will cost the district about $1,400 to replace each backflow device. The cost includes parts and labor. The devices are made of brass. The metal is selling for anywhere from $1.45 to $2.70 per pound depending on the type of brass, experts said. Law enforcement agencies have been trying to crack down on recycling yards in recent years, because that’s where thieves try to sell their stolen metal. State law requires scrap yards to collect detailed information from sellers, including pictures of the item and the seller’s name, driver’s license and license plate number. Assemblyman Brian Nestande recently proposed a bill that would earmark up to $70 millioncq to help California law enforcement prevent metal thefts. His bill proposes 1 percent of all metal sales go into a pool of funding. The money would allow agencies to put together teams and develop specific methods to battle metal theft. People should call authorities if they see anyone not wearing a district uniform or driving a district truck tampering with water equipment, Engel said.